In the 1830s, Jules Pellier invented a sidesaddle design with a second, lower pommel to the sidesaddle. In this design, still in use today, one pommel is nearly vertical, mounted approximately 10 degrees left of top dead center and curved gently to the right and up. The rider’s right leg goes around the upright, or fixed pommel, which supports the right thigh of the rider when it is lying across the top center of the saddle. The lower right leg rests along the shoulder of the left (near) side of the horse and up against the second pommel (called the leaping head or leaping horn.) which lies below the first on the left of the saddle. It is mounted about 20 degrees off the top of the saddle. This pommel is curved gently downward in order to curve over the top of the rider's left thigh, and is attached in a manner so that it can pivot slightly, to adjust to the individual rider. The rider places her left leg beneath this pommel, with the top of the thigh close or lightly touching it, and places her left foot in a single stirrup on that side. 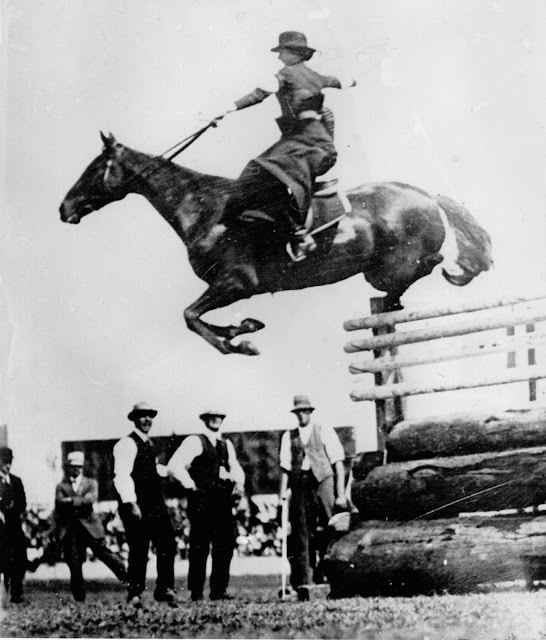 Mrs. Esther Stace riding sidesaddle and clearing 6'6" at the Sydney Royal Easter Show, 1915, a feat made possible because of the leaping horn. The impact of the second pommel was revolutionary; the additional horn gave women both increased security and additional freedom of movement when riding sidesaddle, which allowed them to stay on at a gallop and even to jump fences while fox hunting and show jumping. With this design, nearly all recreational equestrian pursuits were opened to women, yet they could also conform to expectations of modesty. For example, a world record in sidesaddle show jumping was set at 6 ft, 6 inches at a horse show in Sydney, Australia in 1915. The leaping horn was the last major technological innovation for the sidesaddle and remains the core of basic design even for saddles of contemporary manufacture made with modern materials.